There were other epiphanies: one in Edmonton (1932), one (perhaps two) with Blake (1933), another in Seattle (1951), and still another on St. Clair Avenue in Toronto (early 1950s). The “Third Book” Notebooks contain a hint of a fifth epiphany––in 1944 on a walk down Bathurst Street in Toronto. A final epiphany may have occurred in Yugoslavia only four months before Frye’s death: he speaks of “that loud flash I got in Zagreb: the ideal of spontaneity, where the moment of composition and the moment of performance are the same” (The Late Notebooks of Northrop Frye 1:415). Frye refers to these moments variously as intuitions, epiphanies, illuminations, and enlightenments. Most of them were experiences of unity––experiences, as he says, “of things fitting together” in a momentary flash of insight (Northrop Frye in Conversation 48). Although Frye did speak about the Blake and Edmonton epiphanies in several interviews, he never mentioned them in his books and essays. But in his notebooks there are more than thirty references to one or another of these experiences, the most important of which seem to have been what he calls his Seattle and St. Clair illuminations. I have found Frye’s accounts of these experiences to be as endlessly fascinating as they are enigmatic. The references are often quite cryptic. In Northrop Frye: Religious Visionary I took a stab at analyzing the Seattle and St. Clair epiphanies (90–6), but the different kinds of recognition that came to Frye on these occasions remain something of a riddle. Perhaps some blogger out there would be interested in sifting through the various notebook entries with the aim of providing illumination of these illuminations. What follows are the relevant passages. The references at the end of each entry are to the volumes in the Collected Works of Northrop Frye. Page breaks and other editorial insertions are within square brackets. 2. A much more recent dream concerns a maroon-colored book which mentions St. Augustine & explains everything; an archetype that started with Spengler in Edmonton & grew through the spring of 1940 when I was holding Lovejoy’s Chain of Being in my hand and trying to find out about Neoplatonism [Northrop Frye’s Notebooks and Lectures on the Bible and Other Religious Texts 31]. 3. In the old diagram the Logos vision is a universal full of particulars; the corresponding point of alienation in the new one is a total similitude, Blake’s “generalizing gods” [Jerusalem, pl. 89, l. 30 (Erdman, 248)]. The old Thanatos, or life frozen in hell, similarly becomes the reversal of rebirth, as the total similitude of death turns into the particular point of light that turns similitude into the universal identity. That is what resurrection means now. Cayley: Did you see right away that you had found your teacher in Blake? Frye: Not right away. But here was a fascinating character that very little had been said about. Two years later, after my graduation, I was at Emmanuel, where Herbert Davis, who was a Swift scholar in the graduate school, gave a course on Blake, and I signed up for it. I was assigned a paper on Blake’s Milton, one of his most difficult and complex poems, and started working on it the night before I was to read it. It was around three in the morning when suddenly the universe just broke open, and I’ve never been, as they say, the same since. Cayley: What was it? I know you can’t describe the experience, but what was it in Blake that provoked this experience? Frye: Just the feeling of an enormous number of things making sense that had been scattered and unrelated before. In other words, it was a mytholog­ical frame taking hold. Frye: Conversions usually relate to the other side, the experience. As a Methodist I was brought up converted. I never went through a conversion pro­cess. Frye: Well, it was really getting the other half of what conversion is about. Frye: The feeling that here I was dealing with an extremely complex poem of Blake’s about Milton, with whom he obviously had a very close, intricate love–hate relationship. Toward the end, I had the feeling that what united Blake and Milton, for all their differences—one was a Puritan and the other was very much an eighteenth-century nonconform­ist—was their common dependence on the Bible and the fact that the Bible had a framework of my­thology that both Milton and Blake had entered into. Of course, by that time I’d shucked all the anxiety side of the religion I was brought up in. Cayley: What actually happened that night? 1. Letter to Pelham Edgar, 9 August 1948. “The third year came your eighteenth century, and I signed up for a paper on Blake. From then on I was hooked. You may remember the paper. In my fourth year I could hardly talk about anything but Blake, and Helen gave me the one-volume Keynes Poetry and Prose for my graduation present. Next year was theology, and I snatched at a graduate course on Blake that H.J. Davis was giving. That year I read all the secondary sources on Blake, and Davis assigned me a paper on Milton. I sat down to write it, as was my regular bad habit in those days, the night before, and around about two in the morning some very curious things began happening in my mind. I began to see glimpses of something bigger and more exciting than I had ever before realized existed in the world of the mind, and when I went out for breakfast at five-thirty on a bitterly cold winter morning, I was committed to a book on Blake. (Northrop Frye: Selected Letters 1934–1991 37). Frye: I don’t know whether it would be as complete as that, but there certainly were moments when I realized I was turning a corner. When I stayed up all night to write a paper on Blake for graduate school, I knew, at the end of it when I went out for breakfast, that I was going to write a book on Blake, and fifteen years later it appeared. Gzowski: Can you describe that understanding? How would you know that? Frye: Well, I had the very bad habit, in those days, of writing my assignments the night before I was to deliver them, and somewhere around three in the morning something very funny started happening in my mind. I was commenting on one of Blake’s most complex and difficult poems [Milton] and I began to get glimpses of a world that I had never imagined could exist in that many dimensions before, and nothing came clear at that point except that crystal clear determination: someday or other, I’d write a book about this. Gzowski: That’s Blake. I mean . . . you were Blake. 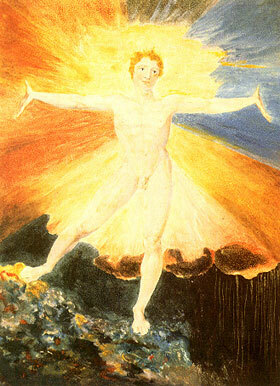 Alexander: You’ve spoken of your coming to an awareness of Blake as a kind of epiphany. Can you describe that experience? [In one of his notebooks, Frye writes that all of his fictional ideas “tend to revolve around Rilke’s idea of the poet’s perceiving simultaneously the visible & the invisible world. In practice that means a new type of ghost or supernatural story, possibly approached by way of some science fiction development. The idea is a vision of another life or another world so powerfully plausible as to make conventionally religious & anti‑religious people shake in their shoes. I’ve begun notes on this many times, but threw away my best notebook, written in Seattle, in a London (Ont.) hotel. By ‘shake in their shoes’ I don’t mean threats, but the ecstatic frisson or giggle aroused by plausibility” [Northrop Frye’s Fiction and Miscellaneous Writings 140]. This is the only place Frye ever mentions having disposed of a notebook, a regrettable act, especially since he calls it his “best notebook.” As it was written in Seattle it seems highly likely that it would have contained an account of his Seattle epiphany. But we do have the following accounts of the Seattle illumination. 2. “God is perhaps not so much a region beyond knowledge as something prior to the sentences we speak.” That’s Foucault’s Order of Things p. 298, what I should have quoted earlier instead of the Nietzsche nonsense he goes on with [par. 635]. 6. When have I had sudden runs like this (if this is one) and is there a pattern in them? There’s the oracle-wit stuff in Seattle, the mind-soul-body stuff, undated, but a Sunday morning, and the stuff at the beginning of the “mystical” notebook in 1946 [Notebook 3]. This entry was posted in Bob Denham, Call for Papers, Epiphany on August 31, 2009 by Bob Denham. Bob, that’s really interesting stuff! Do you have anything to say about the realization about The Four Zoas that John Ayre describes Frye experiencing “while sitting in the bored husband’s seat in a women’s wear shop on Yonge St. just below Bloor” (p. 177)? Does Frye record this anywhere – Ayre doesn’t give a source. It’s not so much a spiritual vision as a realization about how he had to present Fearful Symmetry. What Ayre calls the “absurdly mundane circumstances” fascinate me. Rather like Francis Thompson seeing Jacob’s ladder pitched between “heaven and Charing Cross”? Russell: I’d forgotten about Ayre’s account of the Four Zoas recognition–Los displacing Orc, it seems to have been. It certainly sounds like one of those momentary flashes of insight and similar to the others. So far as I know, Frye doesn’t mention it elsewhere, but it pretty clearly should be added to the list. Perhaps he recorded something about it in his original Blake notebook, which is not extant. It would be interesting to know that date of this epiphany. Early 1940s, I’d guess. Frye does have a similar account of Orc-Los business in his 1950 diary: “The tactic of the Blake article is shaping up a little. After I outline his archetypal imagery, which derives from the unfallen world, I go on to archetype of narrative. The archetypal narrative is the heroic quest, which is the Orc cycle. This is in Blake, but he’s not primarily interested in it, as he sees the cyclic shape of it too clearly. That’s the reason for the difficulty in trying to wedge Jungian archetypes, which are all narrative ones, into Blake. The shift over from the Orc cycle to the Los pattern of progressive & redemptive work is really the centre of the problem in [L] [Liberal] that converges on what I call the dialectic development of the conception of the hero. In Blake the cycle of narrative emanating from & returning to the unfallen world is seen so constantly as a simultaneous pattern of significance that the reader has to get this perspective before he can read: it isn’t unfolded to him passively in a narrative sequence. (Diaries, 431). Thanks for calling attention to the omission. As Russell Perkin observes, Frye’s epiphanies concern realizations of solutions to a central or major obstacle in his theorizing, solutions which bring about a sudden crystallization in his thought. They are Eureka moments, mightily magnified versions of what anyone might undergo when they make a breakthrough writing an essay or a book: the sense that everything suddenly comes together, fits together. They are critical or theoretical epiphanies but without ceasing to be spiritual or religious. “As the hero or heroine enters the labyrinthine lower world, the prevailing moods are those of terror or uncritical awe. At a certain point, perhaps when the strain, as the storyteller doubtless hopes, is becoming unbearable, there may be a revolt of the mind, a recovered detachment, the typical expression of which is laughter. The ambiguity of the oracle becomes the ambiguity of wit, something addressed to a verbal understanding that shakes the mind free. This point is also marked by generic changes from the tragic and ironic to the comic and satiric. Thus in Rabelais the huge giants, the search for an oracle, and other lowerworld themes that in different contexts would be frightening or awe-inspiring, are presented as farce. Finnegans Wake in our day also submerges us in a dream world of mysterious oracles, but when we start to read the atmosphere changes, and we find ourselves surrounded by jokes and puns. Centuries earlier, the story was told of how Demeter wandered over the world in fruitless search of her lost daughter Proserpine, and sat lonely and miserable in a shepherd’s hut until the obscene jests and raillery of the servant girl Iambe and the old nurse Baubo finally persuaded her to smile. The Eleusinian mysteries which Demeter established were solemn and awful rites of initiation connected with the renewal of the fertility cycle; but Iambe and Baubo helped to ensure that there would also be comic parodies of them, like Aristophanes’ Frogs. According to Plutarch, those who descended to the gloomy cave of the oracle of Trophonius might, after three days, recover the power of laughter. The Secular Scripture provided the final clue in my review of the oracle–to–wit epiphany in Northrop Frye: Religious Visionary. It’s certainly true that Frye’s epiphanies are almost always related to one or more of his diagrammatic, deductive schemes. In the Seattle epiphany the framework seems to be the axis mundi, which Frye would describe many years later in Words with Power as the mountain or ladder archetype. In a letter to Brian Coates (31 March 1971) Frye set down what might be taken as a gloss on the Seattle (oracle to wit) epiphany, where recreation emerges from a demonic descent. “I think one should keep in mind, when dealing with modern literature, that the mythical map of the universe is much more ambiguous than it was before the Romantic period. For Dante, heaven was up there, hell down there, and consequently all myths of descent were likely to have a sinister or demonic implication. In modern times, the poles of the mythical universe are not heaven and hell, nor are the poles consistently associated with certain spatial projections. The two poles are alienation and identity. In some writers, including Blake and Shelley, the pole of alienation is associated with the sky, and the pole of identity with a submerged world like Atlantis. It is quite possible to have a demonic descent them, as the one in Heart of Darkness or the Waste Land. But it is equally possible to have a journey to the deep interior in search of identity. It is only in this latter case that the theme of rebirth is really built into the mythical structure. The theme of rebirth may of course also be expressed by the theme of eternal recurrence, as it is in Yeats and in Finnegans Wake. And of course recurrence may be looked at in two ways: as an ironic unending cycle or as an image of recreation and the making of all things new. In Finnegans Wake it is unmistakably both; Yeats warbles on the point, partly because he was trying to listen to “instructors” who didn’t know what they were talking about” (Northrop Frye: Selected Letters, 1934–1991, 124). Thanks, Bob, and Joe! The date of the women’s wear shop revelation would seem to be 1943, from the context in Ayre’s biography.